So we bought the RV, as described in the last post here. What do we do next? Hit the road, of course! A few days ago, we headed west for the Ozarks. In keeping with our idea of slow travel, we planned to drive halfway there, spending the first night in Tupelo, Mississippi. Suffice it to say we learned some lessons this day. Never turn down a tiny road without clearly seeing signs for your campground (or insert other destination), if it feels wrong, it probably is, etc., etc. The next morning, it was my turn to drive. After leaving the campground, we stopped once more, this time at Home Depot, and though it was really easy to get INTO the shopping center, it was more exciting getting OUT. Thank God for our walkie talkies and Jerry’s instructions from outside the coach. It fits in places you would never think it would. Ha. The ride along US 78/Future I-22, through Memphis to I-40 and I-30, was fairly uneventful to Hot Springs, Arkansas, and our destination for a week, Catherine’s Landing RV park. Just south of the city of Hot Springs and the Hot Springs National Park, this lovely campground sits on Lake Catherine and has a mile of lakefront, in addition to many other amenities including a beautiful saline pool and kayak, boat, and bicycle rentals. Turns out we were lucky to get a pull-through site for a week, as there is an Airstream group here this weekend that almost took over the place! 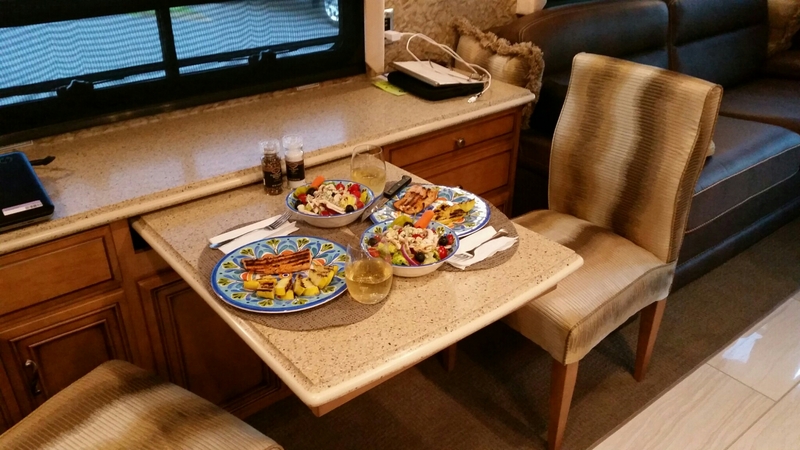 That evening, we made our first real dinner in the coach: grilled salmon and yellow squash, and a garden fresh salad. Oh, and wine, of course! Yum. 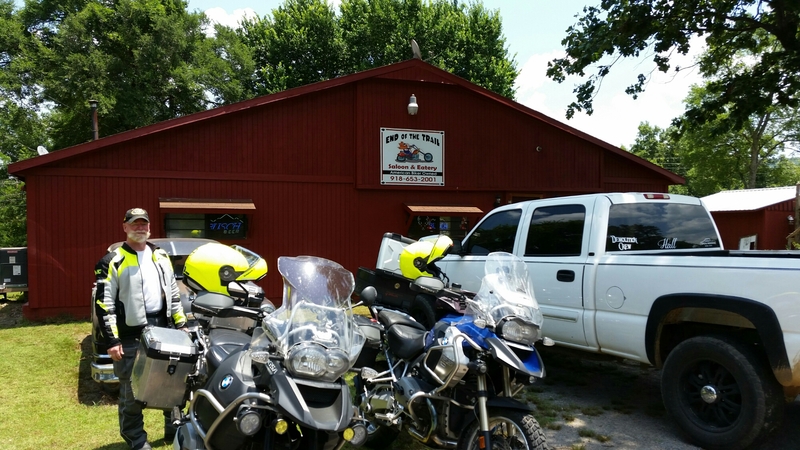 Since we came to the Ozarks to ride, the next day we headed west to the Talimena National Scenic Byway. Bikes released from the trailer and ready for a ride! We had heard about this scenic drive for many years, starting with the Honda Valkyrie group we joined during our formative riding years. We rode for an hour or so to reach the starting point, in Mena, Arkansas. We took a quick water break in Mena, as the temps were already in the high 80s, due to the high-pressure system causing unseasonably warm temps across the US. 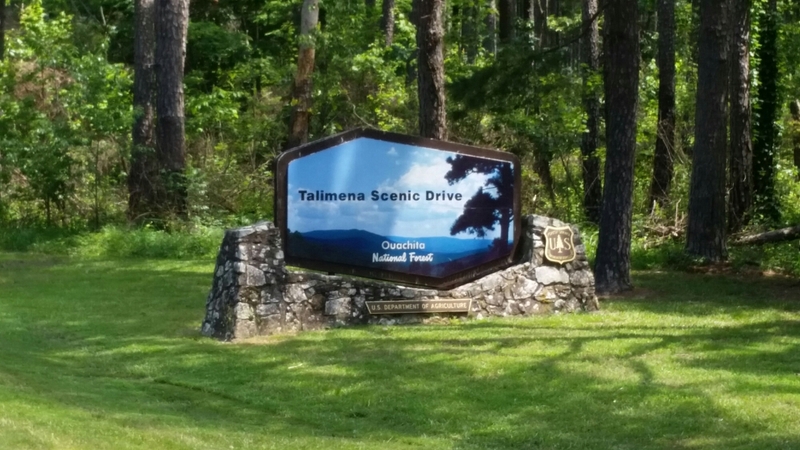 The Talimena scenic drive spans 54 miles and passes from Arkansas to Oklahoma on the crest of the Rich and Winding Stair mountains in the Ouachita National Forest. 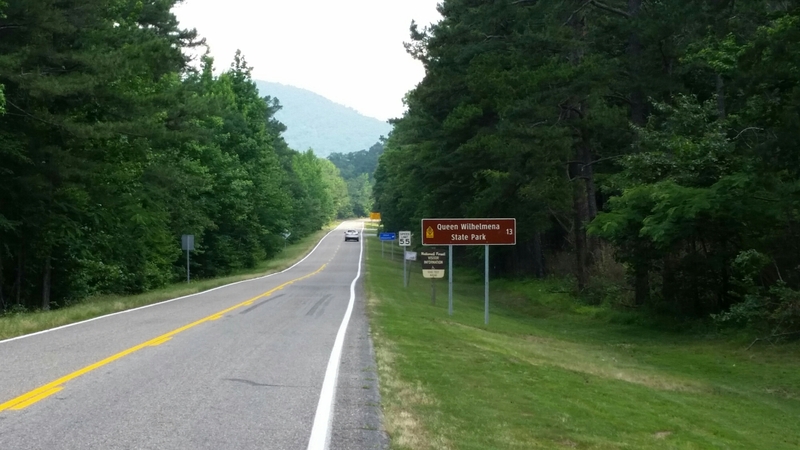 Along the drive, we found we would soon encounter Queen Wilhelmina State Park, and thinking we could have lunch with a view, we headed for the lodge. This is a good example of the FUN to be had on the scenic drive! We love any road that is preceded by bright yellow squiggly road signs! A sample of the twisty bits of this ride! 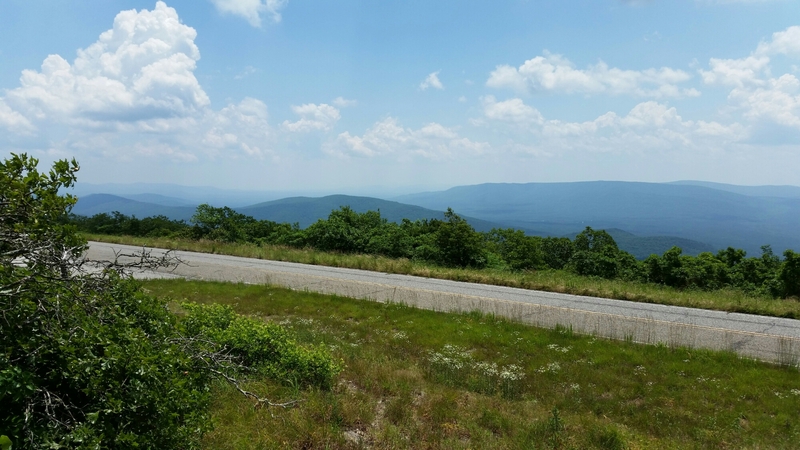 We stopped at several of the scenic vistas, providing gorgeous if hazy, views of the surrounding mountains. At this elevation, the forces of strong winds and ice storms sculpt the white oaks into a veritable miniature forest. In the valleys below, these same trees might grow to over one hundred feet! With building appetites, we arrived at Queen Wilhelmina State Park and proceeded up the hill to the lodge. The parking lot was packed with cars, so imagine our surprise when we were informed that the lodge did not open until July 1st, after a two-plus-year closure for renovation, and was only open that day for a press event. Bummer. And then the lodge employees shared one more bit of news…part of the Oklahoma side of the scenic drive was closed due to rock slides and washout of the road caused by the tremendous rain suffered in Texas and eastward. Unfortunately, we had not done our research, so we were not aware of this closure. We then had to decide on a detour (there were a couple of options), and figure out where we could finally get lunch! Priorities, you know! By now it was HOT, mid-90s, and we were starving. We made a choice and headed for the nearest town, 18 miles away. And then we saw it, like a biker oasis in the desert, the End of the Trail Saloon. And by desert I mean there was nothing around this place for MILES, with the exception of one of the fine Oklahoma Department of Corrections facilities. A number of examples of two- and three-wheeled American Iron graced the parking lot, and everyone inside was appropriately attired in black, orange or multi-colored bandanas. We didn’t stand out in our high-viz and white at all. I have to say, despite our level of hunger, the Texas brisket sandwiches, fries, and coleslaw were all excellent. It truly was an oasis, perfectly timed. The rest of the ride was warm, up to 95 degrees F, and we were happy to get back to the coach to cool down. The outside temp cooled slowly, so we delayed starting our evening meal accordingly. I must mention a new product we bought for our RVing adventures, the O-Grill, because it performs so darn well! This portable propane grill outperforms much more expensive full-size grills, and we enjoyed perfectly cooked tenderloin filets, accompanied by baked potato, sliced tomatoes and fresh tossed salads this evening. Another fine day in the life of the RVing, motorcycling, curvyroads gang! Thanks for reading and following along. You can go straight to the next installment of this story by clicking here. Thanks, Cindy! We are learning a lot and having a ball! You are sweet to worry, Nancy! We are so excited to have this luxurious place to land each night and no packing and unpacking! Yay! Exactly, but you can cruise anywhere YOU choose! oooo sounds like you’re having a great time. itsn’t it wonderful? you make me want to hit the road. but alas i must wait. Thanks, Lynn, it is so much fun! And it will be July in a minute, so you don’t have to wait too much longer! Sounds like a great adventure. Your RV is magnificent–I have literally lived in cabins that were smaller. Amazing. Thanks, John! We hope to have lots of fun, for sure! Looks like you are enjoying yourselves! The song that comes to my mind is “Give me 40 acres to turn this rig around”. Have fun and the Ogrill looks cool! Thanks, Dar, we ARE enjoying ourselves. But you have that right…40 acres would work to turn it around! LOL and yes, the ogrill is awesome! Just found your blog and subscribed! Loving the pictures and stories so far! It is really so very good. I think that I have been so busy living, after so many years of working at a PC all day, when I had time to write between work assigments, that I haven’t had time to share it!!! No problem – we’re not going anywhere!